These things can supply up to 4A at 3.3V and can be hacked for other output voltages too. Care must be taken to remove a couple of components that are not good for output voltages > 5V or so. Absolute maximum input voltage is 23V, which is a bit sad as it can't be used with cheap (not tunable) 24V power supplies. The best guide I've found so far is this one. I haven't tested these things with higher loads yet, but one of these is happily driving one of my LED projects (about 0.7A, 12V --> 4.5V). 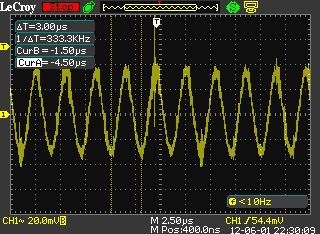 Shutdown current is about 60µA - not too bad. If anybody thinks about removing the legs on the modules, be careful! They are press-fitted and you can easily rip off pads. You have to wiggle them a lot, don't just pull. This mailbag was full of teasers about future shows. Maybe that is the mailbag appeal? Be careful when you muck about with the line cutter - it uses a small explosive charge to cut the line. It won't release anything, but it will surprise the hell out of anyone in the very unlikely event that static electricity sets it off! Yes! Dream come true to see the CYPRES torn down. Both the skydiving rigs I've owned have had a CYPRES AAD (Automatic Activation Device?) fitted. The only part you generally see is the little single button/LCD/LED module. As the instructions say you turn it on the morning and forget it - if it has to fire you've either seriously screwed up or been knocked unconscious. Both happen in skydiving and all being well the CYPRES saves both. And yes, 750' is sufficient - reserves are designed to open more quickly than main canopies, which are designed to stage the opening a bit more to keep peak deceleration forces down. I've never had a reserve deployment (let alone a CYPRES fire), but apparently reserve openings from terminal are not fun. I wonder whether it would be possible to rig up a little barometric chamber to fool the device into firing? Crack on and take it apart! Is it just me or is dropshipping random DealExtreme junk getting old already? At least send something interesting. Mike already wasted his time on a dirt cheap power brick. That CYPRESS is only meant to fire the release at 4.5 seconds before impact if you can't pull the reserve yourself such as being knocked out or tangled in lines it is just a back up you are still meant to cut away your main chute and pull your reserve manually. Also look into reserve static lines some chutes are set up to automatically pull the reserve if the main is cut away. Personally I think RSL's are dangerous but it seams to be the way new jumpers are heading. There has only been one time I wanted to try a parachute.......... But the bus driver did manage to land without mishap, although it is rather disconcerting to have a 40 ton fire truck pacing you on the dirt next to the runway with a foam cannon at the ready. Fault with the landing gear was the sensor switch, after 3 hours I got back in the plane to get to my destination on the round robin trip, and arrived at work in time to go home. Interesting to lean out the door with the flight engineer and both of us agreeing the landing gear did look locked every time we cycled it. Those DC - DC converters are amazingly useful, soldering the adj resistors directly onto the pcb results in a very small unit, I replace AAs with 18650s and use these to step the voltage down. I also use them in my RC remotes, which usually have linear regs, burning away half the power. As for the battery, I was hoping it would be a poor example; I have seen a lot with just a few resistors and that is all, leading to a very dangerous product, however, i am glad it is a good unit, I might buy one for my phone (MB860 is a Motorola Atrix from telstra). 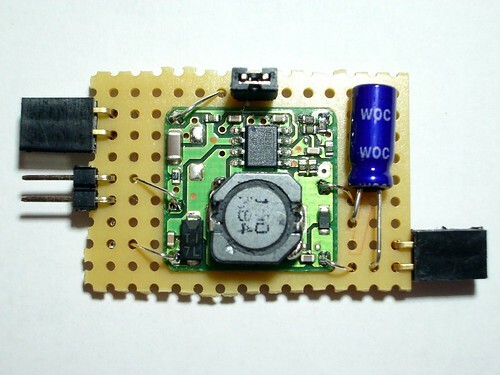 The dc-dc converter is very popular in Chinese website. It is amazingly cheap and versatile. You can convert it to step down, step up or constant current. I have about 20 pcs of them. Be sure to connect input and output capacitors. A 22uf MLCC at output will greatly reduce ripple. Dave, check out the bit in the manual on the into page that you so-nearly got to, about how many lives that gizmo claimed to have sold in a decade! Incredible. Reminds me Martin Baker who always advertise how many "lives saved to date". They have or used to have a big sign out the front of the building with the tally. Looks like an example of this automatic reserve shoot system activating! Police said the man's main parachute had failed to open properly. His first attempt to open his reserve parachute was unsuccessful. It eventually opened automatically just 200 metres above the ground, police said. "It slowed his descent however he still landed heavily. Ouch.. Ah well, at least it did work. Hope that he recovers. and i have followed several guides to modify them for specific output voltages. and even going back to basic with the MP2307 datasheet..
i pick a new one for each try.. and have gone through half the bag now. and im not sure what im doing wrong but i cant make them work properly. i find that the output voltage varies with the load?? Mine work nicely in step-down mode. Maybe your input voltage is too low and it can't regulate anymore. The link to the modification-guide I used is in the first post of this thread. there is a fair chance that it would provoke a Dave Rant about measurement Confidence . turns out my otherwise Reliable decade old non fluke meter's battery was running low..
turns out.. my scope does not measure the voltage change..
might need to get a fluke.. cant believe how much gray hair this has caused..